Could you imagine learning Russian in a day? Now it’s possible! It’s easier than it looks, just a day of study and you will know everything! Have you ever wondered if it would be difficult to learn Russian, but you never tried? Well, we suggest giving a try to our Russian courses for English speakers! Do not be afraid because you will obviously bump into some obstacles at the beginning. However, giving in to some difficulties while learning a new language is the worst thing you can do! Do you want to be able to have a proper conversation in Russian? Then try our course to learn Russian conversation or, at least to understand a basic conversation in Russian. 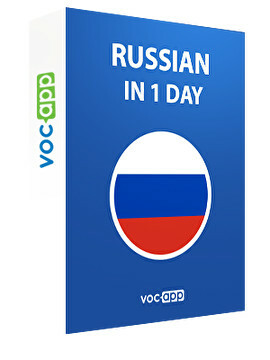 Get rid of online Russian language courses or free online Russian language courses and embrace our way of learning, embrace VocApp! With this course you are going to build your Russian vocabulary in a solid way. You will never forget what you learn thanks to our Repetition System that will tell you when it's high time to revise! Remember the paced repetition is the key to learn a new language, especially when it comes to learning Russian because you won't have many occasions to practice it! So, do not miss a chance to put yourself to the test, just let us suggest you when and how! Do not stop learning Russian, keep on studying with us. Have a look at Russian: day 2 and Everyday phrases in Russian .